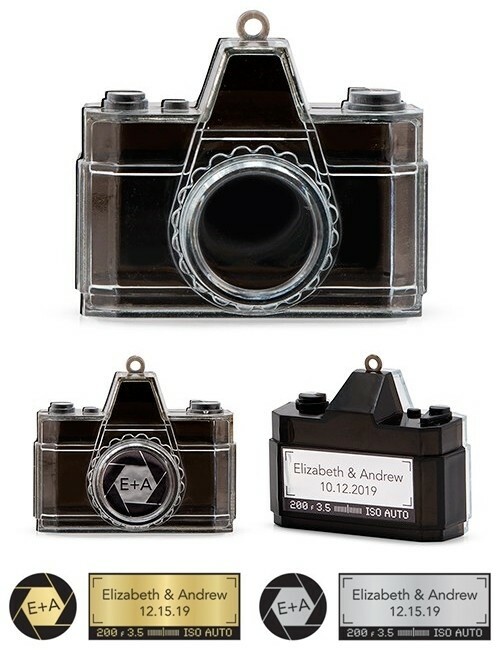 Dimensions: 2" x 2 1/4" x 1"
These miniature novelty camera replicas are perfect favor containers for a photography-lovers' event. Even better, they may be customized with personalized stickers in your choice of metallic gold or silver. PLEASE NOTE: Some assembly is required. Sold as sets of 2 and prices quoted below are per set. Due to personalization, the minimum order quantity is six (6) sets. Left Initial: Enter 1 letter. Right Initial: Enter 1 letter.